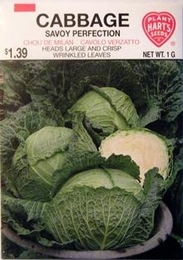 Savoy Cabbage is of much finer quality than ordinary Cabbage, being sweeter with more delicate flavor, and should have its place in every garden. Produces large round heads. Water regularly and fertilize every 3 to 4 weeks. Harvest when head is firm by cutting just under the head. Contains Calcium, Iron and Vitamins A, B, and C.
Planting time - Early to late spring or indoors in CowPots 4 to 6 weeks before danger of frost is past. 5lbs of Cabbage seed needed per acre, 8oz needed per acre if using transplants. Normally, 1oz of seed can produce 2500 cabbage plants.